Did you know that you can see the Moon during the day? Many people only notice our Moon at night, when there is considerably more contrast between the Moon and the night sky. Being the second brightest object in the sky (after the Sun, of course) and with Venus visible during the day to trained eyes, it’s no real surprise that the Moon is visible during the day. Why then, do so many people act surprised when they notice the Moon during the day? What makes it possible for the Moon to be visible during the day? Understanding how and when you can spot the Moon is a matter of knowing the different lunar phases, specifically the relationship between the Sun, Earth and the Moon during each phase. The image below shows the simple geometry responsible for each of the Moon’s distinct phases. In the diagram it’s pretty easy to see that when Earth is between the Sun and the Moon, we see a full moon. When the Moon is between Earth and the Sun, we see a new Moon. The other phases are simply transitions from new to full and from full back to new. 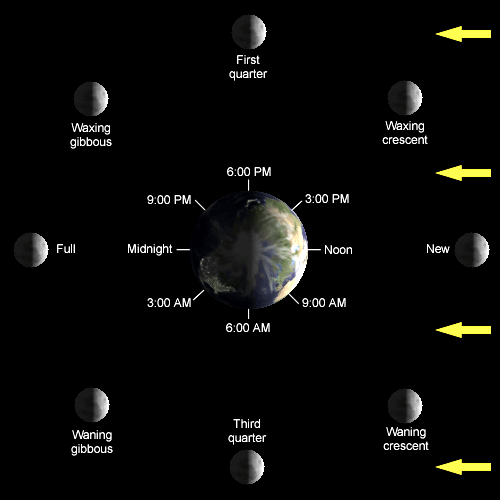 Schedule of Moon Phases. Times shown indicate when the moon is overhead. Based on the orbital geometry of the Moon, there will certainly be times where the Sun will partially illuminate the Moon, during the day and at night. What makes the lunar cycle even more interesting is that the moon rises about an hour later each day, and yet invariably, a full moon rises near dusk and sets near sunrise. The reverse is true in that a new moon rises near sunrise and sets near dusk. Why don’t we have a lunar eclipse during each full moon, or a solar eclipse each new moon? I’ll explain the conditions needed for a solar or lunar eclipse in an upcoming article. In the meantime enjoy the transition from waning gibbous to waning crescent over the next week and get your telescopes out during the weekend of the 25th. The Moon will almost be at its new phase. Just what created the big blue spiral in the sky over Norway in the early morning hours of Dec. 9, 2009? Time traveling Borgs? Psychedelic aliens? Most likely, it was something much more terrestrial and much more boring. Many reports say it was the failed launch of a Russian rocket, probably a Bulava ICBM, a problem-plagued Russian missile that reportedly had several test launches scheduled. Although Russian officials haven’t confirmed this (and in fact one official denied there was any rocket launch in the area) an anonymous Russian military source said it actually was failed launch from a submarine in the White Sea early Wednesday morning. UPDATE (Dec. 10): Russia has finally admitted a missile accident with the Bulava ICBM. This rocket already has failed six of 13 previous tests, according to the BBC, so Russia might have been a little embarrassed about it. Visible in the images and videos is the sunlight just beginning to peek over the horizon which would have back-lit the fuel. Another launch on November 1 also caused strange light phenomenon in northern parts of Norway, although not as spectacular as the one today. It also caused speculation as to the cause, but it came from the launch of a Sineva missile from the nuclear submarine in the White Sea. Aurora: Not likely. No aurora has ever taken on this shape. Birkeland Current: Again, not likely. A Birkeland Current a magnetic field aligned current in the Earth’s magnetosphere which flows from the magnetotail towards the Earth on the dawn side and in the other direction on the dusk side of the magnetosphere. Birkeland currents often show filamentary, or twisted “rope-like” magnetic structure, and they create the aurora Borealis and Australis when they reach the upper atmosphere. Poisk module: This Russian module undocked from the International Space Station yesterday, and a employee at Boeing said the module would have had unspent fuel which would have been released on reentry. However, the timing doesn’t seem to be right as to when it would have burned up the in the atmosphere. Projection: There has been some talk this was just a projection on the sky. However, the phenomenon was seen in a wide area, meaning such a projection would have to be huge. Again, not likely. Here’s a link to a video of the spiral forming. According to NRK, there were advance warnings about several Russian missile launches from the White Sea from December 7-10, but an anonymous source in the Northern Fleet said they had no information about the incident. Press Attaché from Russia’s Embassy in Oslo, Vladimir Isupov, did not have any immediate information that could explain the light phenomenon over Northern Norway. UPDATE: Doug Ellison from UnmannedSpaceflight.com did a very cool simulation of a tumbling rocket stage throwing out unspent fuel in two directions, and what it would look like. The question, though would be how the spiral of fuel was lit. It possibly could have been back-lit by the soon-to-rise sun. Another eyewitness said, “We saw it from the Inner Harbor in Tromsø. It was absolutely fantastic. It almost looked like a rocket that spun around and around, and then went diagonally down the heavens. It looked like the moon was coming over the mountain, but then came something completely different, “said Totto Eriksen. We’ll keep you posted on any explanations that come out on this! somewhere. My guess is it entered steeply from the North,” he said. Anyone else in or near Indonesia see anything similar? Blinking spots of intense light are being observed all over the lower atmosphere of the Sun. Not just in the active regions, but in polar regions, quiet regions, sunspots, coronal holes and loops. These small explosions fire elegant jets of hot solar matter into space, generating X-rays as they go. Although X-ray jets are known to have existed for many years, the Japanese Hinode observatory is seeing these small flares with unprecedented clarity, showing us that X-ray jets may yet hold the answers to some of the most puzzling questions about the Sun and its hot corona. Although a comparatively small mission (weighing 875 kg and operating just three instruments), Hinode is showing the world some stunning high resolution pictures of our nearest star. In Earth orbit and kitted out with an optical telescope (the Solar Optical Telescope, SOT), Extreme ultraviolet Imaging Spectrometer (EIS) and an X-Ray Telescope (XRT), the light emitted from the Sun can be split into its component optical, ultraviolet and X-ray wavelengths. This in itself is not new, but never before has mankind been able to view the Sun in such detail. It is widely believed that the violent, churning solar surface may be the root cause of accelerating the solar wind (blasting hot solar particles into space at a mind-blowing 1.6 million kilometers per hour) and heating the million plus degree solar atmosphere. But the small-scale processes close to the Sun driving the whole system are only just beginning to come into focus. Up until now, small-scale turbulent processes have been impossible to observe. Generally, any feature below 1000 km in size has remained undetected. Much like trying to follow a golf ball in flight from 200 meters away, it is very difficult (try it!). Compare this with Hinode, the same golf ball can be resolved by the SOT instrument from nearly 2000 km away. Thatâ€™s one powerful telescope! The limit of observable solar features has now been lifted. The SOT can resolve the fine structure of the solar surface to 180 km, this is an obvious improvement. Also, the EIS and XRT can capture images very quickly, one per second. The SOT can produce hi-res pictures every 5 minutes. Therefore, fast, explosive events such as flares can be tracked easier. Putting this new technology to the test, a team led by Jonathan Cirtain, a solar physicist at NASA’s Marshall Space Flight Center, Huntsville, Alabama, has unveiled new results from research with the XRT instrument. X-ray jets in the highly dynamic chromosphere and lower corona appear to occur with greater regularity than previously thought. X-ray jets are very important to solar physicists. As magnetic field lines are forced together, snap, and form new configurations, vast quantities of heat and light are generated in the form of a “microflare”. Although these are small events on a solar scale, they still generate huge amounts of energy, heating solar plasma to over 2 million Kelvin, create spurts of X-ray emitting plasma jets and generate waves. This is all very interesting, but why are jets so important? The solar atmosphere (or corona) is hot. In fact, very hot. Actually, it is too hot. What Iâ€™m trying to say is that measurements of coronal particles tell us the atmosphere of the Sun is actually hotter than the Suns surface. Traditional thinking would suggest that this is wrong; all sorts of physical laws would be violated. The air around a light bulb isn’t hotter than the bulb itself, the heat from an object will decrease the further away you measure the temperature (obvious really). If you’re cold, you donâ€™t move away from the fire, you get closer to it! “We now see that jets happen all the time, as often as 240 times a day. They appear at all latitudes, within coronal holes, inside sunspot groups, out in the middle of nowhere–in short, wherever we look on the sun we find these jets. They are a major form of solar activity” – Jonathan Cirtain, Marshall Space Flight Center. So, this little solar probe has very quickly changed our views on solar physics. Launched on September 23, 2006, by a consortium of countries including Japan, USA and Europe, Hinode has already revolutionized our thinking about how the Sun works. Not only looking deep into the chaotic processes in the solar chromosphere, it is also finding new sources where AlfvÃ©n waves may be generated. Jets are now confirmed as common events that occur all over the Sun. Could they provide the corona with enough AlfvÃ©n waves to heat the Sun’s corona more than the Sun itself? I donâ€™t know. But what I do know is, the sight of solar jets flashing to life in these movies is awesome, especially as you see the jet launch into space from the original flash. This is also a very good time to be seeing this amazing phenomenon, as Jonathan Cirtain points out the site of solar jets reminds him of “the twinkle of Christmas lights, randomly oriented. It’s very pretty”. Even the Sun is getting festive.